Did You See the Teachers Demonstrating This Week? Here’s Why. SDFA members walking along the side of the district office. 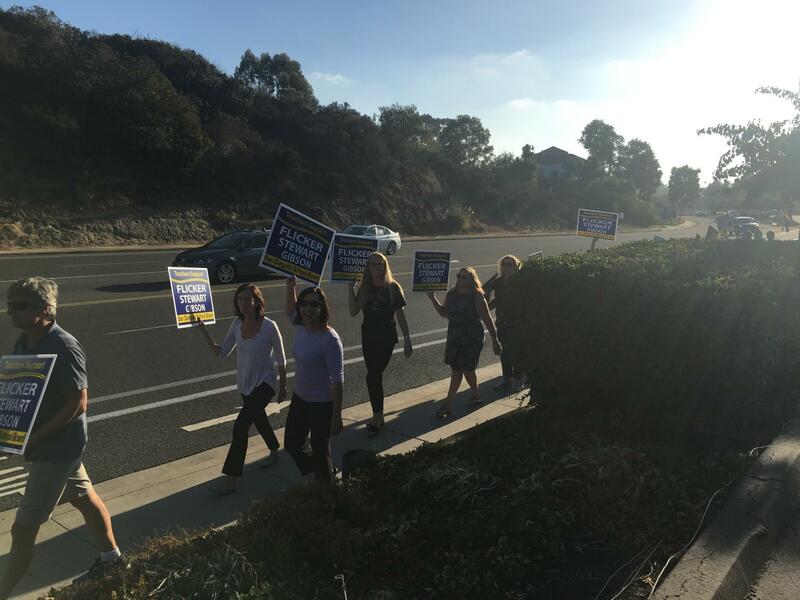 More than 40 teachers and faculty from the San Dieguito Union High School District rallied yesterday evening outside the district office to show their support for school board candidates Amy Flicker (Voting Area One), Rhea Stewart (Area 3), and Kristin Gibson (Area 5). The demonstration, put on by the San Dieguito Faculty Association (SDFA), began at 5:30 p.m. and continued for about an hour, shortly before the start of the school board meeting. Blue signs displaying the candidates’ names were distributed to the crowd by SDFA President Tim Staycer, who gave an instructional speech before sending them to march up and down the sidewalk on the corner of Encinitas Boulevard and Delphinium in neat, single-file lines. The members chatted as they waved their signs at passing by cars, many of whichhonked in support. I wish you all the best in your endeavours to promote candidates who have had students in the school district and who have been actively involved, supportive and loyal. It is so important to have strong candidates on the school board who support staff and district goals. I hope that they are elected in November.